This inspirational altar piece makes an inspired contribution to a funeral service ? one that truly shows how much you care. 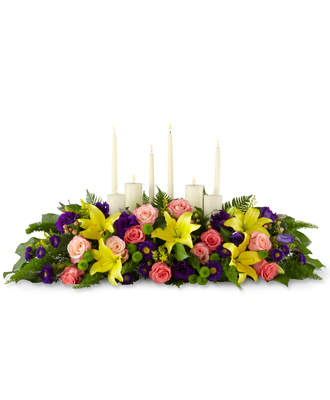 Consists of peach and coral roses, purple lisianthus and asters, yellow Asiatic lilies and lush green accents in a long, low arrangement, it makes a natural setting for a variety of candles (included). As an accompaniment to a funeral, it?s an excellent choice for most services both elaborate and simple. Product is not appropriate to send to a residence.